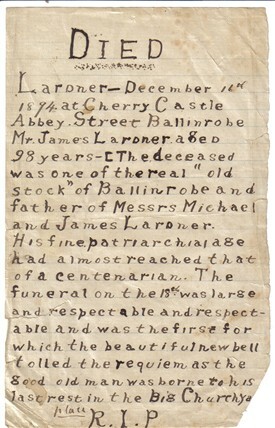 Hand written copy of death notice for Mr. James Lardner, Cherry Castle, Abbey St. Ballinrobe. When I started to research the builders of St. Mary's R.C. Church, Main St, Ballinrobe I discovered a very useful site with connections to Ireland and some aspects of Ballinrobe History. Written by Maggie Blank, the website has a great variety of images from Maggie's own collection, various newspapers and the National Library of Ireland. Until further information is available, I draw you attention to the Lardner Family who were stonemasons involved in the erection of the tower of the Church c. 1895. This family may have come to Ballinrobe c. 1783 and were certainly well established when the workhouse was being built. If anybody has further information please allow us to share it with the Ballinrobe Community. Remember "Capture it before it disappears". 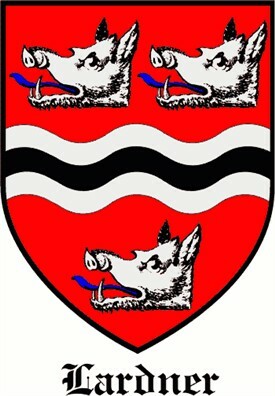 This page was added by Averil Staunton on 02/07/2011. My wife, Kerri Lardner, and I visited Ballinrobe in Sep 2014. It was the best part of our Ireland vacation. We found the burial place of several Lardner's. All of the people in the town were so friendly and helpful. Can't wait till our next trip. Editor's note: Nice to hear from you Tom and glad you enjoyed your trip to Ballinrobe. You will have noticed, no doubt, some of the wonderful stonework of the Lardner Family. Did you know that one of the family was the head mason who had the honour of capping the steeple of the local St. Mary's Church! Thrilled to find this site. My great grandmother was Margaret Lardner, married to John Robert Lindsay, and lived at 948 Perrin Avenue, Council Bluffs, Iowa. Margaret's brothers were stonemasons and contributed to the building of a small Catholic church in Chicago, Illinois, USA. I know little else aside from their resting places. I'd appreciative any additional knowledge you may have, or a source I can turn to. Reply: Thank you for contacting us. You might find this site useful.